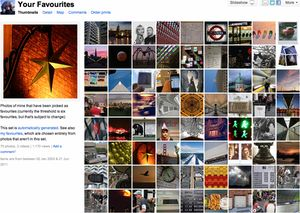 For a long time, I’ve maintained a set called Your Favourites on Flickr, which contains those photos that lots of people have marked as, well, a favourite. Of course, it would be nice if this had a web interface, and if it offered to let you choose a set to use or to create a new one, and so on, but I already had the set, and like I said, I’m lazy. Feel free to fork it and make it do any of that stuff. As usual, the code for this lives in github as favset – patches are welcome. The obvious thing it needs is some sort of scheduling ability – I’d like my set to be updated every couple of days, so it’s always current. I’ll get round to that eventually, I’m sure.